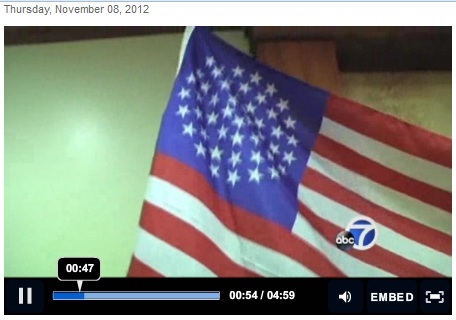 This is not the American Flag; it is the flag on display at the October meeting of the purported California Assembly of the Republic for the united States of America. Source: From KGO-TV video. Tim Turner, the purported “President” of the “Republic for the united States of America,” is in jail — charged with trying to pay his taxes with “a fictitious $300 million bond and to have assisted others in attempting to pay their taxes with fictitious bonds purporting to be worth amounts ranging from $10 million to $100 billion,” the U.S. Department of Justice said in September. In October, KGO-TV (ABC7/San Francisco) took a camera to a meeting of the purported California Assembly of the Republic for the united States of America. The meeting was held in Visalia. An I-Team report by the station aired yesterday. It included video taken at the meeting and elsewhere. Some attendees of the Visalia meeting pledged allegiance to a flag other than the American Flag and recited an “oath of citizenship” to a country other than the United States, the station reported. Purported citizenship papers were symbolically stamped with a thumbprint in red ink to mimic a “blood oath,” the station reported.